The words "cabinet coup" appear in several papers, including the Sunday Times. The paper says there have been what it calls " a frantic series" of private telephone calls in which senior ministers are said to have agreed that the prime minister must stand down. The paper says it spoke to 11 cabinet members who described Mrs May as an "erratic" figure whose judgement has "gone haywire". 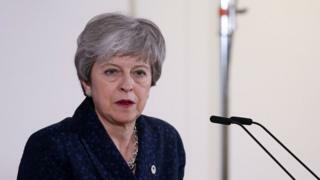 The paper says Mrs May will be confronted at the next cabinet meeting, with at least six supporting the de facto deputy prime minister, David Lidington, as a caretaker leader to deliver Brexit. The march in support of another Brexit referendum also features in the papers. The Observer describes it as "historic" and says it was a "compelling demonstration of disdain" for the prime minister's tactics and support for Brexit. It argues that a growing number of voters are unwilling to allow politicians to use a vague notion of "the will of the people" to drive through what it calls "divisive and potentially catastrophic agendas". In other news, the man dubbed "the speedboat killer" has agreed to return to Britain, according to the lead story in the Sunday Mirror. It says Jack Shepherd has told friends he will stop fighting extradition from Georgia, so he can serve his sentence in the UK for killing Charlotte Brown. Shepherd went on the run a year ago before being sentenced to six years for causing the death of the 24 year-old on the River Thames. The paper says he is expected to accept his return at a hearing this week, and could be heading back to Britain within the next two weeks. A source tells the paper: "He knows he's just delaying the inevitable - and lengthening his sentence by staying." And the Sunday Telegraph highlights a retired British engineer who has become a celebrity in the Czech city of Prague. Trevor Sage, who moved to the city in 2006, regularly cleans the 311 memorial stones that mark where Holocaust victims once lived. The brass-plated stones are set in the city's pavements and detail the names and dates of birth of those who died. The report says that Mr Sage's efforts with cleaning fluid and a sponge have brought him extensive publicity since he started his mission in June. The 59 year-old from London tells the paper: "It's essential the memories are kept alive so we don't forget the lessons of the past."